This post is an agglomeration of the entire trip, so it is intentionally shorter than a full day-by-day trip journal would be, had we produced one in real time. The following are snippets of impressions that have endured in the 1.5 years since we returned. We flew into the Victoria airport, which is actually in Sydney, with our bikes unscathed. Vanessa’s aunt Steph met us at the airport and sweetly offered to transport our gear to her house where we were going to spend the night prior to and after the trip. Free from the extra hundred or so pounds each, we pumped our tires and embarked on a preview of the hills that we had in store for us as we made our way to the home of our lovely hosts. The next morning we had a leisurely breakfast, a prolonged final pack and gear check, then a fight with Alex’s fender before we finally hit the road around noon. 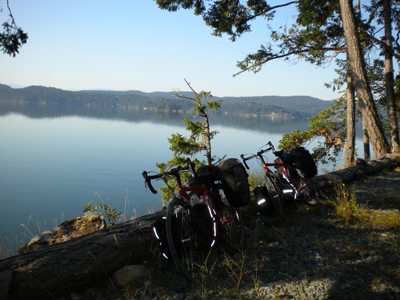 Our first day of riding was fabulous, thanks to the Lockside Trail from Sydney to Victoria and the Galloping Goose from Victoria to Sooke, we had the luxurious enjoyment of flat rail trails for the majority of our 70km ride. We also encountered a remarkable cultural shift toward cyclists on the island, where drivers would actually stop and wave us through, smiling no less, compared to the Toronto experience where we have grown accustomed to obscenities, door prizes and cut-offs at every turn. By the end of the day we were feeling pretty good and maybe even a little over confident, “That was easy, I can do that everyday for a week no problem!” We tucked into an ‘unofficial’ (read: stealth, shhhh) camping spot at the Sooke end of the Galloping Goose trail, it was kind of spectacular. We learned plenty of hard-earned lessons this day, starting with: always take bike-route advice with a grain of salt when it comes from someone in a motorized vehicle. Instead of taking the main highway from Sooke to Jordan River we were advised to take a back road (Otter Point); it had little traffic, no bikes, sharp turns and A LOT of VERY STEEP hills. This was by far the most difficult stretch of the trip and also the shortest distance traveled out of all of our cycling days (approximately 35km). Maybe it was that we were undertrained but Alex maintains that this section would have still kicked our asses at the end of our trip when we were stronger. We spent half of the day pushing our wide loads up vertical stretches; another lesson: it is usually better to just stay on the bike and crank your way up, but at the time that felt totally impossible. By the time we rolled into Jordan River it was late afternoon and we were totally depleted so we decided to call it a day and camp at China Beach. To our dismay we were hit with the major lesson of the trip: DO NOT assume that just because a settlement appears to be of a decent size on a map, that it will have food services available. Jordan River did not have any retail stores or restaurants (there had been a market/food stop sometime in the recent past but it was boarded up). This was an important lesson coming from South Ontario, where even on country roads there seems to be a gas station or general store every ten clicks at least. Luckily we had enough food rations left from our previous grocery shop to make a pasta dinner and oatmeal breakfast (sans eggs, sadly). On the up side, China Beach was absolutely gorgeous. We also met some wonderful people and we were intrigued that ravens seem to occupy the role the crow plays in Ontario as a nuisance bird. This day started with a cloud of trepidation, we were terrified that the rest of the way to Renfrew would be of the same ilk as the road that led us to Jordan River, “what have we gotten ourselves into?” However, we were delighted by the much milder grades that greeted us on the way to Port Renfrew. The road was still hilly, of course, but was far more manageable and the law of the mountain kicked into effect: what goes up must come down. The descent into Port Renfrew is absolutely the most intense, exhilarating and petrifying encounter that we have ever enjoyed on a bicycle, it was about 7-ish kilometres of sheer madness! Picture us careening down winding mountain roads that would otherwise be a straight drop if not for the sharp turns. We both had the brakes pulled back the whole way down, which only slowed the acceleration! There was no way (other than tragedy) to stop even if we wanted to, thankfully there was little traffic so we were able to occupy the middle of the lane while navigating the bends. (Unfortunately, we didn’t have an odometer for this trip so there’s no record of our exact speed.) We made it to town well before lunch, but not before seeing a couple of burned-out cars along the way, apparently they too had trouble with some of those hills! 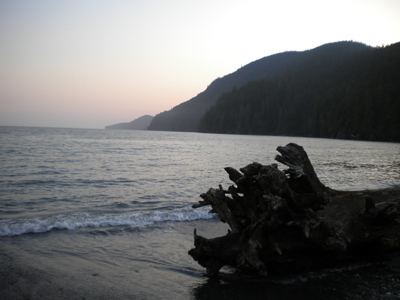 Port Renfrew is a small village with a population of about 350 people. 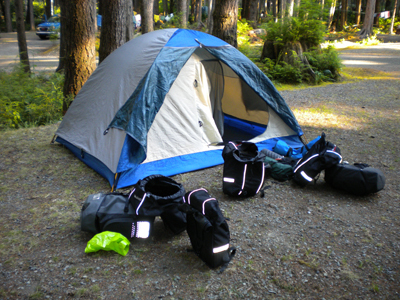 However, because it has a ferry that connects with one of the trailheads for the West Coast Trail, it is teaming with backpackers and is fairly well-serviced. We had a delicious café lunch before clearing out the grocery section of the Port Renfrew general store. Our next day’s ride would be about 70km over an old restored (and now mostly paved) logging road, cutting up to Lake Cowichan. We knew there would be no chance to purchase anything along the route so we made sure we had a few days worth of food and plenty of water in advance. Our next serious decision to make was whether to camp on the beach or in the woods? Oh tough. We found a pretty good mixture of both in the First Nations’ run campground, where we had a sheltered site within a couple of wheels from the water. We started the day with a hearty breakfast at the snack shop at the marina that ranks high among the fishermen (note: go for the breakfast but skip the port-a-potty). We pedalled nervously out to the logging road, knowing that if anything went wrong we would be stuck out there, but the alternative, to go back the route we came in, was even less appealing. This turned out to be one of the most amazing days of the trip. Our route started out with gradual and rolling hills through the characteristic west coast rainforest, so spectacular! About 60-70% into the ride Alex looked up ahead and sucked in his breath, “we’re going to need to have lunch before taking that hill”. Vanessa turned around, “what, it’s just a…Oh- Uggggh” as she saw the switch-back, and another, and another. We stuffed ourselves with food and soldiered up the steep mountain that was blocking our way to Cowichan. As it turns out, the three switchbacks that we could see from the flat ground were just half the battle; the mountain continued to fold up two or three more times before finally maxing out. It must have taken us an hour to climb the damn thing and by then our legs were rendered useless. Fortunately, we again reaped the benefits of the mountain law and spent the rest of the day, and about 20 km, descending from the peak we had just climbed. This part of the route took us through clear-cut forest. Even with our rapid downhill induced speed, on this scorching hot July day it felt like we were riding into a ball of fire. Lake Cowichan was the perfect place for us to do the things we needed to recuperate, namely: eating, swimming, and lounging. This was also the point in our trip where we started to see and meet more people, since the southwest coast was pretty sparsely populated. When moving around on our loaded bikes in our spandex shorts we drew a lot of attention and everyone was curious to hear about our trip. Our favourite comment came from a woman selling us ice cream, after we explained that we were biking around the island to Tofino, “on pedal bikes?”, she exclaimed with shock (motorcycles are also quite popular on the island). We loved the random conversations and interactions so much that we felt a little saddened when donning our rest day clothes, which immediately dropped us down to non-interesting status. 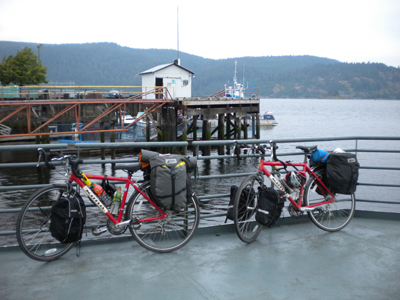 The ride from Cowichan to Duncan was really quite lovely. Our route was along a country road with little traffic as a more major thoroughfare absorbed most of the vehicles intent on barrelling along. The terrain was rolling-flat through some of Vancouver Island’s farmlands, we even picked up some fresh road-side vegetables for which we paid by honour system. After connecting with Duncan we started onto highway 1 to head up island. After the nearly traffic-free southwest coastal ride we found the highway much less attractive but the shoulder was ample and the ride up through Ladysmith was still pleasant enough. Our original plan had been to camp in or around Chemainus or Ladysmith that night, but found we still had some energy left and pushed on. 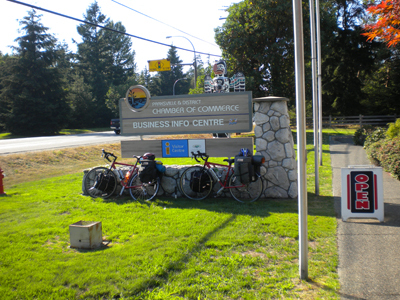 Ladysmith was nice, but there was no camping nearby so we continued toward Nanaimo. 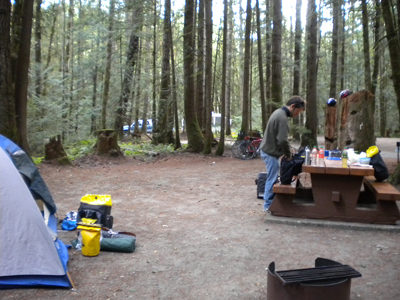 We ended up scoring a fantastic stealth camping spot beside the Nanaimo River just south of the city. To be honest, this was probably our least favourite stretch of the trip, as far as the riding goes. In the morning we rode in to explore Nanaimo and acquainted three local cyclists that were out for a Sunday ride along the picturesque Nanaimo Harbour and downtown. We chatted and rode together as they helped us in our fruitless search for an open bike shop on a Sunday. After lunch we moved on, forcing our way through a headwind, gradual hills and heavy traffic on the island highway, past the rows upon rows of box stores out of North Nanaimo. While it was nice to be allowed to cycle on the highway and to have a generous shoulder, the heat exposure and drain from the highway was getting the better of our spirits. We decided to press on and cover that stretch as quick as possible! We made it to Parksville to settle into Rathtrevor Beach Provincial Park for the night, what a beautiful place! Surrounded by old growth forest and steps from the welcoming town of Parksville, this park is really a gem for road weary travellers. In fact, we arrived on the Sunday of the civic long week-end without a reservation, this meant that we were banished to overflow camping; overflow means setting up tent in a parking lot along with all of the other poor souls who failed to reserve. Even so, this place was worth it, if only for the beach. Despite that the beach opens out onto the Pacific it is remarkably warm with shallow sand bars and gentle waves to rinse off the dust and exhaust that we had been wearing for the duration of our highway ride. Another day, another fabulous provincial park; actually all of the BC parks we visited were very well run, with very pleasant staff and well-maintained facilities. Similarly, the BC visitors’ centres that were located in each town were awesome for all kinds of information on camping, routes, food options, etc. and of course good places to use the bathroom. Good job BC public workers! We had a day to spare in our itinerary here. We were planning on taking the Lady Rose Marine freight vessel from Port Alberni to Ucluelet, and because that route was only available on Mondays, Wednesdays and Fridays we knew that getting to Alberni early (Monday/Day 8) would just mean an extra day in the city. Instead, we opted to head to Little Qualicum Falls for a partial rest day. The ride west island along highway 4 was much more pleasant than heading north on the island highway. The shoulder was slight, sometimes rough and disappeared at times but there was less traffic and we again had trees for some protection from the elements. We stopped on the way to LQF to check out the village of Coombs for some treats. Coombs is notorious for a lack of restriction on commercial development, which makes for a pretty bizarre mix of land-uses –although the predominant use these days seems to lean toward ‘tourist trap’. Upon arrival at LQF we set up camp and high-tailed it to the river swimming hole, complete with rapids and jumping rocks, nice! Setting out that morning we knew we had a big “hump” ahead of us. This is the name given to an infamous hill that separates Port Alberni from the east of the island and apparently even separates weather patterns! Rumour has it that cyclists and drivers alike often need to stop and rest on the way up; the later mostly to check their brakes. This hill is so well known around the island that it came up in conversation with nearly everyone whom we told of our cycling plans. 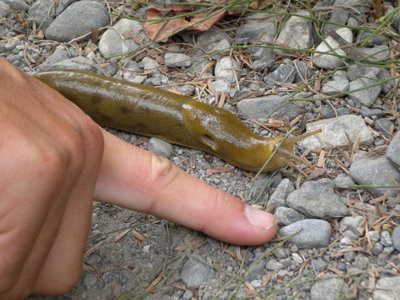 The hump’s reputation had grown solid in our minds, creating a fear that was only antagonized by the fact that no-one had mentioned the hills on Otter Point Road or the switchback between Port Renfrew and Cowichan. 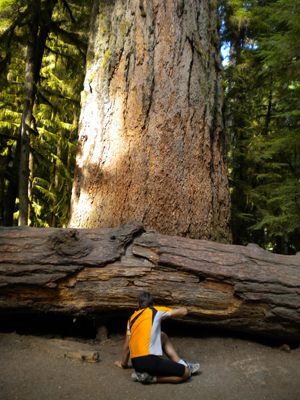 Nevertheless, we started the day with an en route visit to Cathedral Grove and took about a hundred pictures of the enormous Douglas Firs that dominated above us. The magnitude of their presence is so intense but the pictures really can’t even capture the scale of the trees let alone the power of their being. We also met a volunteer site-interpreter who shared a lot of stories about the grove as well as Port Alberni, where she has lived for over fifty years. We asked her about the hump and she noted that many cyclists opt to hitchhike to the top. In all fairness to the hump and all who have conquered it, we’re not exactly eager to climb it from the other side. 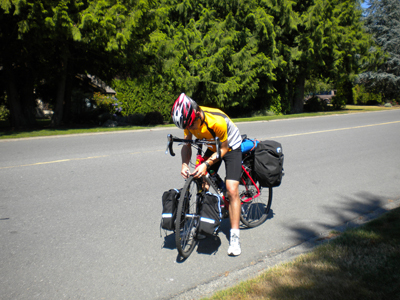 The descent into Alberni brought back memories of Renfrew and was pure exhilaration. 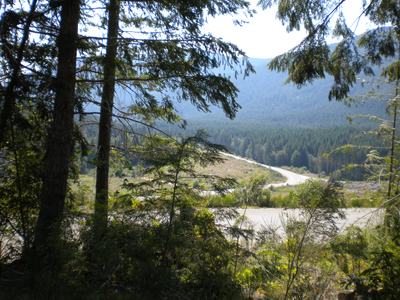 The road was actually a gentler grade than the drop into Port Renfrew but the rumble strips between the shoulder and the road added an extra element of terror at the thought of hitting one and launching off the mountain. Yikes! We rolled into town after stopping at the Visitors Centre to enquire about cheap accommodations. We had our boat to catch the following morning so we figured a motel would be a safe bet to avoid our camp packing ritual on the way to the docks. We went with the cheapest motel option and yearned a little for our tent once our room greeted us with an overpowering smell that was reminiscent of burnt lawn chairs. Without much incentive to stay in our hotel room we ventured out to explore Alberni and find some food. We really enjoyed spending the afternoon just walking the town and getting a sense of everyday life, it was a nice change from some of the RV dominated areas that we had been. We had been cautioned, in all of our trip research, that the highway between Alberni and Ucluelet is a treacherous death-trap and should be avoided by cyclists and even drivers if possible. Apparently the narrow road has sharp turns, steep hills and no shoulder for most of the hundred kilometre route between the two towns. Based on that advice we opted to take the Lady Rose Marine’s Frances Barkley across, and, wow, were we ever glad we made this decision. In fact we not only recommend, but insist, that anyone visiting that corner of the island take a ride on the Barkley. Lady Rose Marine is a family owned company and is exceptionally managed and staffed. ‘Frances Barkley’ is the vessel that has replaced the now retired ‘Lady Rose’ as a freight and passenger vessel that services the small coastal communities that have no road access! 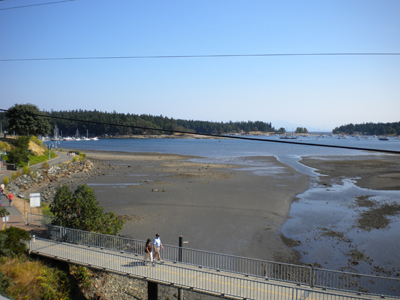 It also transports walk-on passengers to Bamfield, Barkley Sound and Ucluelet. Our day started with a quick ride to the docks for departure at 8am. Staff members kindly assisted us in finding a safe spot to lock our bikes to the railing and then we were able to enjoy the ride. The ship had a decently priced cafeteria where we enjoyed breakfast while chatting with a friendly couple from Vernon, BC. About mid-way through the sailing, the captain announced that a whale could be seen in the distance. Of course this brought everyone clamouring up on deck to catch a glimpse. The ship’s crew accommodated our voyeurism and even steered off course a little to catch up with an Orca that was swimming due west. We got within ten feet and were able to catch many fin and spout visuals but we were too slow with the camera. Further along we came across a pod of humpbacks and again our wonderful crew brought us in close and helped us spot the whales that were popping up all around us. So for a grand total of $37 each we experienced a four hour boat ride with excellent customer service and two pods of whales, all for less than half the price of a whale-watching tour. 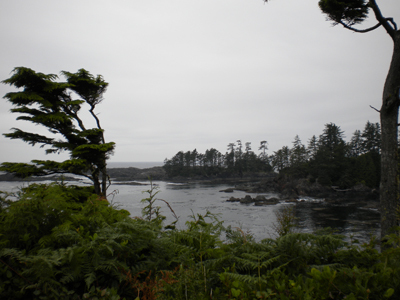 In an effort to delay the pending finale of our trip we opted to stay for two nights at the campground in Ucluelet and so we spent a day exploring the town and hiking the Wild Pacific Trail, which of course was spectacularly gorgeous. Ucluelet was also the only place in our trip that we had been able to build a campfire, due to an intense heat wave that had dried out the rest of the island. Ucluelet’s position on the north-wet coast has earned it a reputation for rain and fog that it lives up to quite well. Although the colder temperatures meant Vanessa had to buy a second-hand toque, it also meant we could finally, safely have a campfire cooked meal, and jiffy-pop. This day started with a bit of drizzle, which amounted to the full extent of precipitation that we crossed on our trip, not bad luck! We warmed up from the cold morning with the uphill out of Ucluelet to the highway junction en route to Tofino. After that short bit, the rain stopped and the road flattened out as we whipped along, riding through Pacific Rim National Park. We stopped briefly to pop onto Long Beach, which is well known as one of Canada’s most beautiful beaches and the only Canadian surfing locale. Funny enough, after riding through all of the diverse and stunning terrain through the different regions on the island, one picture of Long Beach was enough for us and we continued on. We spent the rest of the day exploring Tofino and eating, as usual. We capped off our day with a six dollar bottle of champagne and an incredibly delicious pizza from Breakers Café. We are big fans of bus and train service that accommodates bicycles, thank you Tofino bus. The 7+ hour ride back to Victoria really made the distance of our journey sink in. We wrapped up with the final thirty or so kilometres from Victoria back to Sydney along the Lockside Trail, what a treat it would be to commute daily on that route! All in, we had the best trip (to date in 2009) of both of our lives. The sense of achievement in shattering personal limitations, conquering mountains and travelling sustainably, added sweetness to the amazing towns, villages and wilderness of Vancouver Island. While we knew that we undershot the amount of daily distance we could cover and therefore had a few really short riding days, this approach really allowed us to meet people and experience our surroundings. The early days of the trip were some of the most challenging but also the most rewarding in both accomplishment and scenery. If given the chance we would do this route again without question and without changes, aside from perhaps lengthening some distances. One word: Amazing!